Franke FilterFlow taps are available as single taps or with the compact, space saving Filterflow Filter Kit undersink filter system. With the elegant beauty of their most stylish designs, Franke have a tap that will enhance the appearance of any style of kitchen. 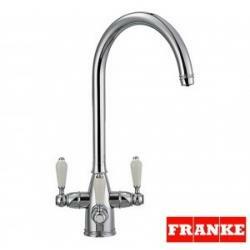 Combined with the technologically advanced ceramic water filtration system Franke's cost effective three way water filter taps are ideally suited to gravity fed & low pressure hot water systems which is not the case with many of the three way taps otherwise on offer. Franke FilterFlow taps are the perfect addition to any modern UK kitchen, allowing you the convenience of a separate filtered water supply, providing drinking water that is clean, refreshing and free of impurities. Combining premium design with ultimate practicality, our Franke FilterFlow taps offer unique solutions that will make kitchen tasks easier while leaving you more useable space on the your kitchen worktop. Having filtered water at your fingertips means no more cumbersome, expensive bottled water and total peace of mind that your home drinking water is clean, safe and tastes great too!.